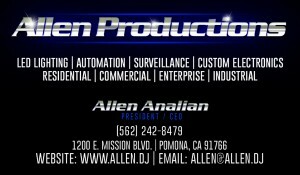 Allen Productions Inc. a leading and diversified, full-service production company specializing in custom state of the art lighting and automation systems located in Los Angeles, California. They are one of the most premier lighting installation companies in Southern California. For more information about all the services or custom specialty services they offer, please feel free to contact them.